My pretty Jade Green M320 makes its second appearance into my rotation. I love this cute little pen that I can only use posted. Look at the tipping on this nib, so stubby! I bought this nib from an online vendor that specialises in selling new old stock pen parts returned from stores. I didn’t even know that Pelikan made an M300 nib in the double broad size. It is old (two chicks) and writes superbly with a wet line. Why oh why can’t Pelikan make their modern BB nibs like this? This is the first of Diamine’s new design bottles to make its way into my possession. They are much the same size and shape as the old shape. They have a wide opening and enough height to allow even the large nib to be submerged. I bought this Diamine Cult Pens special edition mostly for the name. Robert is a weird name for an ink. It came about due to a public vote to name this plus one other ink, and the Cult Pens staff said that the best they could come up with was Robert. 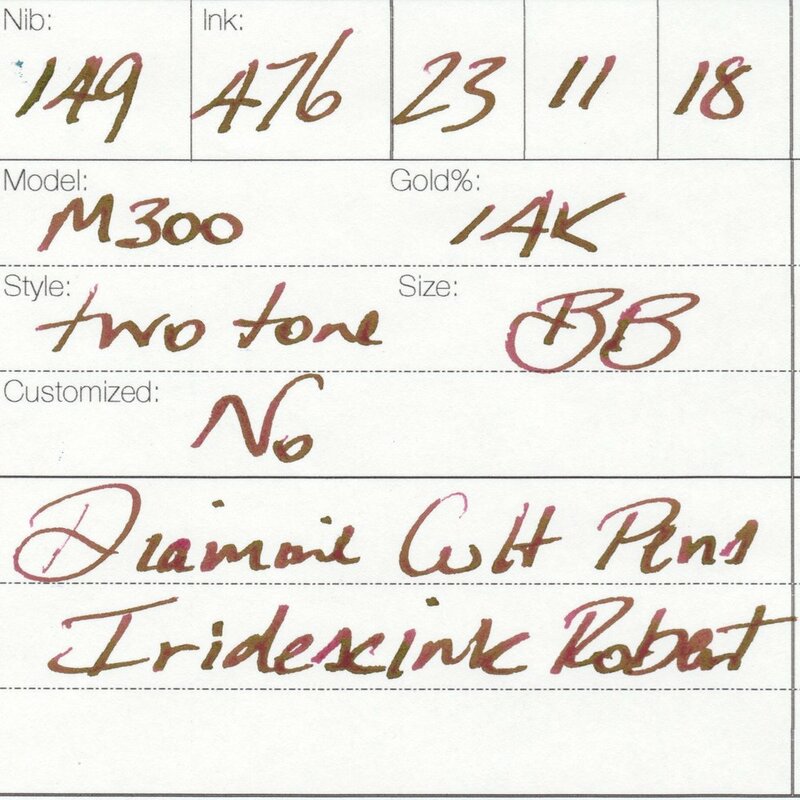 The ink itself lives up to the label of being “iredescink”. The ink’s true colour is burgundy, but on Tomoe River paper it sheens so much that my writing samples look like they were written with gold ink. Even the scanned samples below sheen on half of the letters. I am not usually a fan of super sheeny inks, but I can get on board with this one.